MANILA, Philippines - Emilio Aguinaldo College (EAC) Generals and Mapua Cardinals went berserk in the NCAA men’s basketball match on Monday, September 22, 2014 at San Juan Arena. With 28.5 seconds remaining, a brawl happened when EAC point guard John Tayongtong punched Mapua counterpart CJ Isit that sparked one of the unwanted scenario in Philippine basketball. 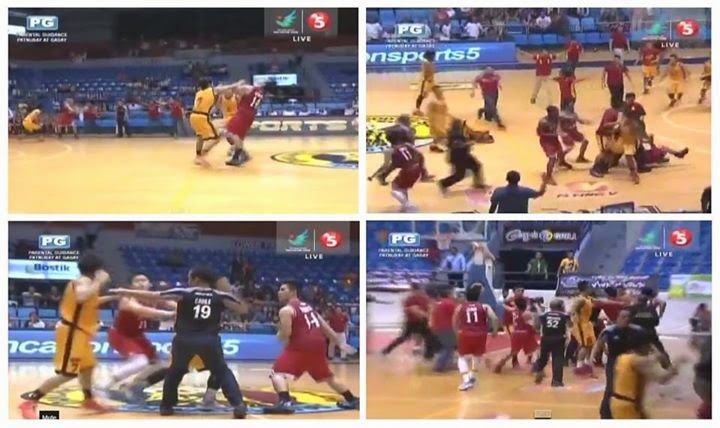 Mapua player responded by pushing Tayongtong to the floor. After a while, it became a free for all with the referees and game bouncers struggled to pacify the tempestuous players. Officials said that all involved players in the brawl will receive at least one-game suspension. Meanwhile, it was declared that Generals won the game, 86 -77. “It was an unfortunate event, considering na good friend ko si Kuya Atoy,” EAC coach Gerry Esplana said, referring to Mapua coach Atoy Co.